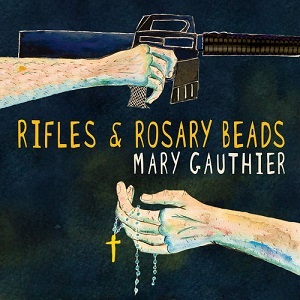 Mary Gauthier's new album, Rifles & rosary beads isn't just another album from this talented songwriter, it's something special. The songs on this album were all co-written with US miltary veterans and their families as part of the five-year-old Songwriting With Soldiers program. Participants of the program have shared that the experience of songwriting was life changing for them, some even said life saving. Something about writing that song — telling that story — is healing. What program co-founder Smith calls post-traumatic-growth. With 22 veterans each day comitting suicide in the US, any project that can help reduce that number must be welcome. Given this then it's understandable that the songs here all have a military theme, but not what I would describe as typical songs about the military. Instead you have songs about a female member of the military being harassed by her fellow soldiers, the emotions experienced as a veteran, the stresses on relationships and more. It's an incredibly powerful album that focusses on the emotional side of things and which feels deeply personal. Without the involvement of the veterans and their families I doubt that it would have been possible to get it so personal without sounding false. Very early in the opening track, "Soldiering on", you get the idea of some of what this album is about with the line "What saves you in the battle, can kill you at home". The adjustment faced when moving from miltary to civilian life, particularly after a war is a challenge that many veterans struggle with. "The war after the war" is told from the viewpoint of the wife of a veteran faced with the stresses of living with a veteran. It's something often overlooked - people think about the difficulties faced by veterans but not necessarily how that affects those they live with. This is a superb album. Mary Gauthier has helped the veterans and their families express their feelings in an incredibly personal and moving way that makes these songs so amazingly powerful. A fantastic album that I can't recommend highly enough.